Lee wanted a chopper. We wanted to build a bike that wasn't sold yet so we could sell it at bike week. We ordered up a CCI Yaffe kit and before it arrived, Lee's request did, so it was sold before we started... Oh Well!! 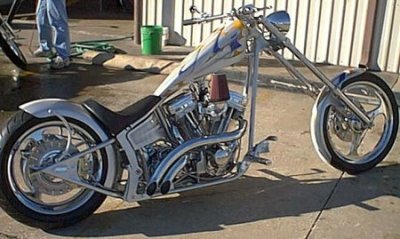 This was a bit of an odd project as we never met Lee (he's a cousin to our man Herb) so we really had a chance to have full design control (it started life as a kit bike after all) and just get some ideas of colors and the like from Lee. As we went we just sent him pictures!! The kit was very complete... all the major components including a Revtech 100 Inch motor, the beautiful Yaffe frame that has the rear fender moving with the swing arm (I was gonna say Articulated, but I figured some might not know the term) so it looks just like a Rigid, yet it is indeed a suspended bike, as well as bags full of bolts marked where they all go... Cooool!!! Of course we started throwing stuff out! The pipes were a joke, so we used a set of Grumpy's 'Twisted Sister' pipes. We could not use the awful stock looking controls, so they were pitched. The open primary was treated to some Trotta covers while we customized the flat plate to fit. Then we chromed all the parts that should have been chromed. We enlisted a new young talent for the paint! 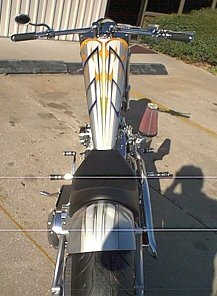 Jason Gray of Gray's Custom Painting (407-310-1235) shot the bike, and while we beat the hell out of him on delivery times and gave him very little input except 'It better look great or you 'aint gettin' paid! ', he came up with a beautiful scheme and it really works with the bike!! If you ever get down to Key West way, keep an eye out for Lee on this custom scoot! !